Combining ultra-light weight and extremely good aerodynamics, the XL-1 is an extremely efficient car at over 260 miles/gallon fuel efficiency. The most fuel-efficient and aerodynamic production car in the world, the Volkswagen XL-1, made its debut at the 23rd Annual Society of Environmental Journalists (SEJ) Conference at the Chattanooga on Thursday. The XL-1 hyper efficient, highly aerodynamic, two-seater car, using a plug-in hybrid drive train that offers amazingly high fuel efficiency figures. The XL1 uses design principles that head away from traditional car design, and borrow heavily from both race car engineering and ideas pushed by energy efficiency thought leader Amory Lovins. Its light weight (1753 pounds), exceptional aerodynamics (Cd 0.19), and a low center of gravity, make it an example of the Hypercar concept originally promoted by Lovins years ago. As an example of its extreme efficiency, in electric drive mode the XL1 consumes approximately 160 watt-hours/mile (.1 kilowatt-hours per kilometer) where typical electric cars consume 240 watt-hours/mile. Measured by the European fuel efficiency standard, it has a 260 miles/gallon fuel efficiency. The drive train contains a 48 horsepower two-cylinder TDI engine, a 27-hp electric motor, a seven-speed dual-clutch automatic transmission, and a lithium-ion battery. It has a top speed of 99 miles/hr, and does 0-60 miles/hr in 12.7 seconds. 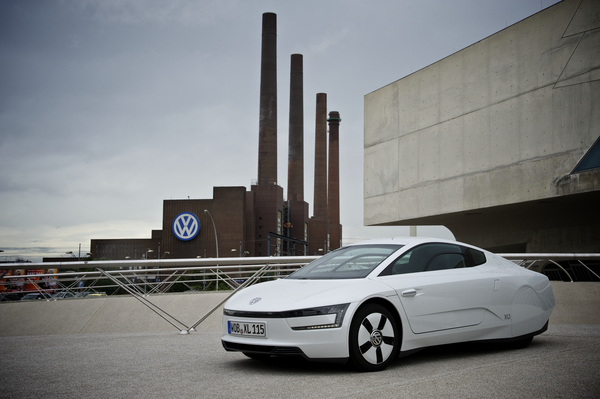 The VW XL1 is the third concept car developed in Volkswagen's 1-liter car category. The company has long been working on a goal to develop a car with combined fuel consumption of one liter per 100 km (235 mpg). With the XL-1, that vision has become real. The XL-1 differs from the previous 1-liter concept, the L1, with passengers sitting side-by-side rather than in tandem. This car began very limited production, about 250 units, during the summer, and will be available only in Europe. Pricing starts at €111,000 (approximately US$146,000).